I was visiting the Getty Museum in Los Angeles recently when I saw the Jean-Francois Millet oil painting, “Man with a Hoe,” painted during 1860-62. 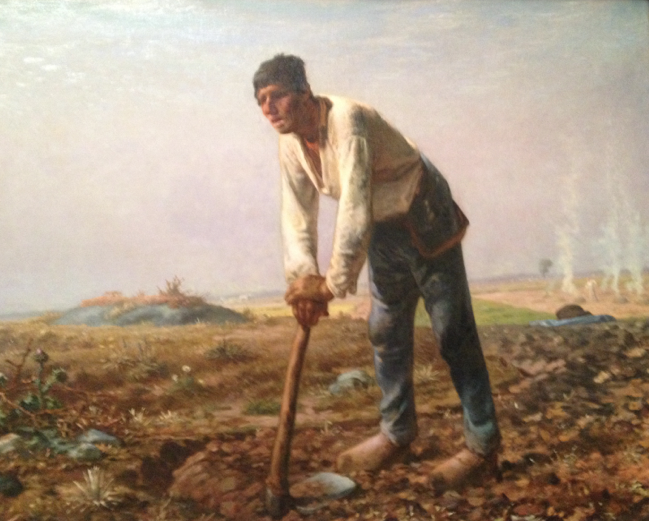 As I gazed at the painting, I began to sense what Millet intended to convey—the utter exhaustion of a peasant as he pauses from the backbreaking toil of plowing a rocky plot of land filled with thistles, weeds, and dry grass. The expression on the man’s face, along with his wearied posture, suggest not only a hard day’s labor but one of a lifetime of endless toil with little progress to show. And yet, the green, productive fields of his neighbors in the background suggest that there might be hope for this man and this bleak plot of land. In that moment I saw in him the countless numbers of individuals whose lives today are mired in seemingly hopeless situations—beaten down, exhausted, depressed, caught between life’s proverbial rock and a hard place, with little or no relief or hope in sight. And in my heart I saw their despair and I heard their anguished cry to God for help. I know what these people are going through—for I’ve been there myself. I’ve been there through life’s deserts—long periods of unemployment, eking out a living in dead-end jobs, facing failure after failure, set back after set back, struggling with depression, and screaming at a seemingly silent God. But always, in the midst of those harsh, lonely, desert places, I would experience God’s mercy, peace, comfort, and joy. And with those blessings, I would find renewed hope and strength to keep on the journey through life. In Mathew’s version of the Sermon on the Mount (Matt, 5,6,7), Jesus teaches about the characteristics of being a disciple in the Kingdom of God, and in verses 3-6 of chapter 5, he blesses the worn-down, broken, and powerless people who recognize their need for him and seek him. He blesses them in their present state—here and now! Those who are poor in spirit—who are utterly helpless to meet life’s challenges but seek God in their poverty of spirit—are blessed to be part of God’s kingdom here and now! Those who mourn—who are in spiritual crisis, sadness, pain, sorrow, grief, and loss, and who earnestly seek God—are comforted with his peace, joy, and strength, here and now, for the journey still ahead. Those who are meek—who in humility know their own ignorance, weaknesses, and needs, and who turn control and discipline of their lives to God—are blessed here and now with God’s assurance that when Christ returns on Judgment Day to destroy the earth, they will receive new eternal bodies and inherit a place in Christ’s kingdom that he will establish on the newly created earth (2 Pet. 3:7-13; Rom. 8: 18-26; Rev. 21:1). And those who hunger and thirst for righteousness—who yearn desperately for a right relationship with God and with people, who care about justice for all, and who earnestly seek God out of their awareness of their own urgent need to be right with him and with people—are blessed here and now with God’s forgiveness and covered with Jesus’ own righteousness (Rom. 3:22; 2 Cor. 5:21). These four beatitudes are a complete reversal of the world’s value systems. The world admires and envies only those who are strong, rich, famous, successful, and powerful. The world cares nothing about the nobodies, the materially or spiritually poor, those who mourn, the meek, or those who seek righteousness and justice. But God cares about such people, and he wants us as disciples of Jesus Christ to not only care for them with his heart of love, grace, and compassion, but also to reflect in our hearts an awareness of our own poverty of spirit, brokenness, humility, and hunger for righteousness. For only then can he bless us—here and now!